The free-standing Fun Fence system gives you the ability to create play zones in all sorts of irregular spaces. 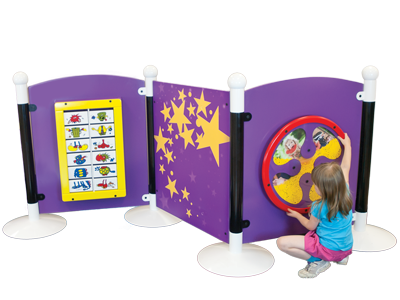 Play activities are affixed to modular panels that are attached to a metal post system. Our unique bracketed swivel post system allows you to manipulate the fence panels into any shape that fits your space.